Ezra Seligsohn grew up in the Modern Orthodox community of Bala Cynwyd, a suburb of Philadelphia. 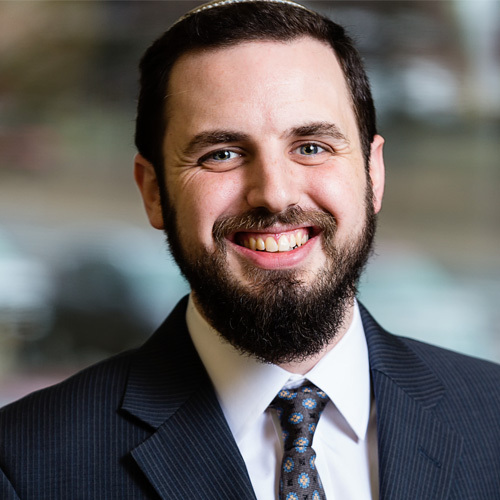 An alum of Yeshivat Har Etzion, Yeshiva University, and a Wexner Graduation Fellow, Ezra aspires to be a kind, compassionate rabbi who can explore and experience with his community what it means to live a religiously meaningful and observant life. Inspired by his summers spent at NCSY Kollel and Camp Morasha Kollel, Ezra has taught teens and adults both formally and informally through Bnei Akiva of the US and Canada, NCSY, and Yeshiva University, and served as a rabbinic intern at The Abraham Joshua Heschel High School. A professional graphic designer and student of Safrut, Ezra fuses his years of design experience with his desire for hands-on work and his love for Jewish text. A close reader of all texts, he particularly enjoys engaging literarily with the Chumash, Midrash, Aggadata, and The New Yorker. Ezra lives in Riverdale with his wife Ma’ayan and sons Ronen and Asher.